Twenty years in several lifetimes’ worth in rock music. It is however, not impossible for a group to last that long. Myriad old rockers (The Rolling Stones, Aerosmith), soul acts—The Four Tops retained the same line-up for 34 years until liver cancer robbed them of Lawrence Payton in 1997 – and country combos trudge on to this day. The rub, invariably, is that whether they’re selling out football stadiums or valiantly attempting to half-fill a minor-ranking Butlin’s, even their most rose-tinted acolytes would struggle to argue that the halcyon days of such groups are but a dim and distant memory. Los Angeles’s Red Hot Chili Peppers are different. This year they celebrate their 20th anniversary and they celebrate it at the artistic and commercial peak of their game. No other group’s career has taken this trajectory – U2 have lasted the course but their output comprises peaks, troughs and popularity which has long plateaued. All great, long-lasting groups, and some pretty dreadful ones, pivot around one key relationship – Mick’n’Keith, Lennon and McCartney, the Gallaghers, Edge and Bono, Strummer and Jones. 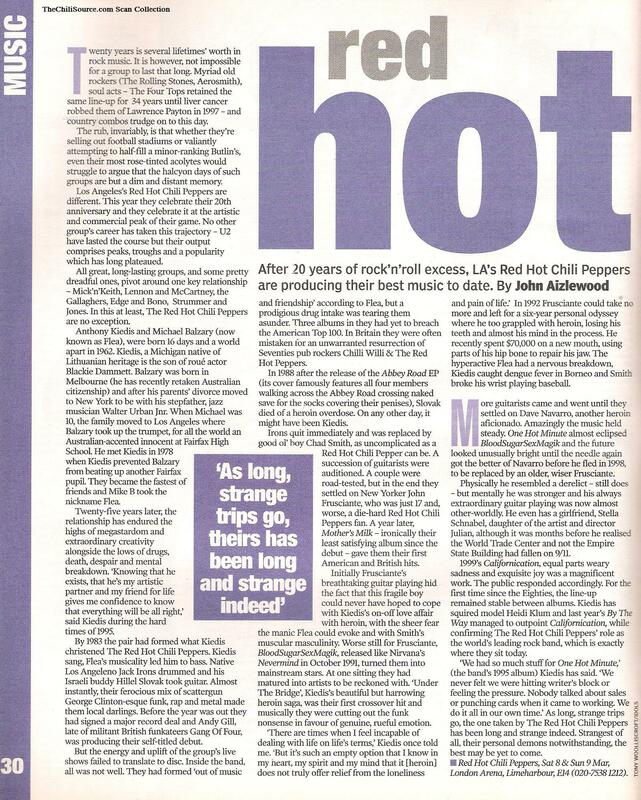 In this at least, The Red Hot Chili Peppers are no exception. Anthony Kiedis and Michael Balzary (now known as Flea), were born 16 days and a world apart in 1962. Kiedis, a Michigan native of Lithuanian heritage is the son of roue’ actor Blackie Dammett. Balzary was born in Melbourne (he has recently retaken Australian citizenship) and after his parents’ divorce moved to New York to be with his stepfather, jazz musician Walter Urban Jr. When Michael was 10, the family moved to Los Angeles where Balzary took up the trumpet, for all the world an Australian-accented innocent at Fairfax High School. He met Kiedis in 1978 when Kiedis prevented Balzary from beating up another Fairfax pupil. They became the fastest of friends and Mike B took the nickname Flea. Twenty-five years later, the relationship has endured the highs of megastardom and extraordinary creativity alongside the lows of drugs, death, despair and mental breakdown. ‘Knowing that he exists, that he’s my artistic partner and my friend for life gives me confidence to know that everything will be all right,’ said Kiedis during the hard times of 1995. By 1983 the pair had formed what Kiedis christened The Red Hot Chili Peppers. Kiedis sang, Flea’s musicality led him to bass. Native Los Angeleno Jack Irons drummed and his Israeli buddy Hillel Slovak took guitar. Almost instantly, their ferocious mix of scattergun George Clinton-esque funk, rap and metal made them local darlings. Before the year was out they had signed a major record deal and Andy Gill, late of militant British funkateers Gang Of Four, was producing their self-titled debut. But the energy and uplift of the group’s live shows failed to translate to disc. Inside the band, all was not well. They had formed ‘out of music and friendship’ according to Flea, but a prodigious drug intake was tearing them asunder. Three albums in they had yet to breach the American Top 100. In Britain they were often mistaken for an unwarranted resurrection of Seventies pub rockers Chilli Willi & The Red Hot Chili Peppers. In 1988 after the release of the Abbey Road EP (its cover famously features all four members walking across the Abbey Road crossing naked save for the socks covering their penises), Slovak died of a heroin overdose. On any other day, it might have been Kiedis. Irons quit immediately and was replaced by good ol’ boy Chad Smith, as uncomplicated as a Red Hot Chili Pepper can be. A succession of guitarists were auditioned. A couple were road-tested, but in the end they settled on New Yorker John Frusciante, who was just 17 and, worse, a die-hard Red Hot Chili Peppers fan. A year later, Mothers Milk – ironically their least satisfying album since the debut – gave them their first American and British hits. 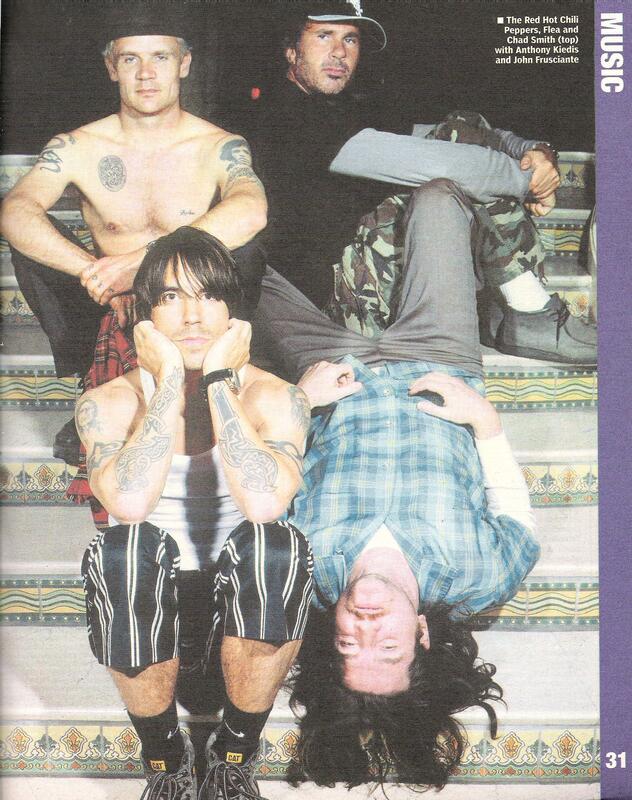 Initially Frusciante’s breathtaking guitar playing hid the fact that this fragile boy could never have hoped to cope with Kiedis’s on-off love affair with heroin, with the sheer fear the manic Flea could evoke and with Smith’s muscular masculinity. Worse still for Frusciante, BloodSugarSexMagik, released like Nirvana’s Nevermind in October 1991, turned them into mainstream stars. At one sitting they had matured into artists to be reckoned with. ‘Under The Bridge’, Kiedis’s beautiful but harrowing heroin saga, was their first crossover hit and musically they were cutting out the funk nonsense in favor of genuine, rueful emotion. ‘There are times when I feel incapable of dealing with life on life’s terms,’ Kiedis once told me. ‘But it’s such an empty option that I know in my heart, my spirit and my mind that it [heroin] does not truly offer relief from the loneliness and pain of life.’ In 1992 Frusciante could take no more and left for a six-year personal odyssey where he too grappled with heroin, losing his teeth and almost his mind in the process. He recently spent $70,000 on a new mouth, using parts of his hip bone to repair his jaw. The hyperactive Flea had a nervous breakdown, Kiedis caught dengue fever in Borneo and Smith broke his wrist playing baseball. More guitarists came and went until they settled on Dave Navarro, another heroin aficionado. Amazingly the music held steady. One Hot Minute almost eclipsed BloodSugarSexMagik and the future look unusually bright until the needle again got the better of Navarro before he fled in 1998, to be replaced by an older, wiser Frusciante. Physically he resembled a derelict – still does – but mentally he was stronger and his always extraordinary guitar playing was now almost other-worldly. He even has a girlfriend, Stella Schnabel, daughter of the artist and director Julian, although it was months before he realized the World Trade Center and not the Empire State Building had fallen on 9/11. 1999’s Californication, equal parts weary sadness and exquisite joy was a magnificent work. The public responded accordingly. For the first time since the Eighties, the line-up remained stable between albums. Kiedis has squired model Heidi Klum and last year’s By The Way managed to outpoint Californication, while conforming The Red Hot Chili Peppers’ role as the world’s leading rock band, which is exactly where they sit today. 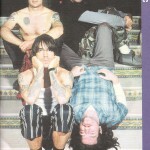 ‘We had so much stuff for One Hot Minute,’ (the band’s 1995 album) Kiedis has said. ‘We never felt we were hitting writer’s block or feeling the pressure. Nobody talked about sales or punching cards when it came to working. We do it all in our own time.’ As long, and strange trips go, the one taken by The Red Hot Chili Peppers has been long and strange indeed. Strangest of all, their personal demons notwithstanding, the best may be yet to come. WOW. I adore these guys, but you brought it all toether so succinctly (is that a word?). Thanks! Their best is always to come.